As the Council developed its website, one of the key features that was envisioned for the website was a capability that allows members (and only members) to connect with one another to discuss real estate issues and fields of mutual interest. Thus, Cornell RE-Connection was born. Cornell RE-Connection is a membership search function, with both basic and advanced search functionality, that allows students and alumni who are CREC members to connect with one another on specific topics and fields of mutual interest. How Does Cornell RE-Connection Work? 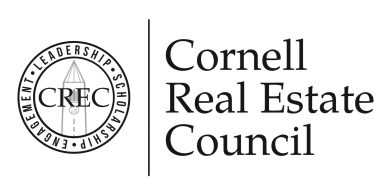 For example, if a student is considering a career in real estate development or in healthcare real estate, using Cornell RE-Connection they can quickly and precisely search for alumni who have expertise and experience in those areas. The student or recent graduate gains valuable knowledge, and the alumnus is able to share their insight and help fellow Cornellians. A win-win. Another scenario involves an alumnus looking for other Cornellians working in real estate in a certain city or region where they are considering a new project or investment. The type and duration of interaction is driven by the participants, and will vary from a single exploratory phone call or email exchange, to a more lengthy dialog that could involve face-to-face meeting. We encourage your participation in Cornell RE-Connection; start learning or sharing your expertise today by completing your profile and searching Cornell RE-Connection. Follow the above instructions to make your profile private.